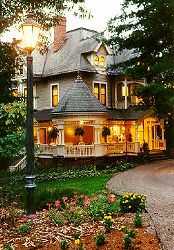 The Wright Inn & Carriage House's location on a quiet, tree lined street and the large old fashioned porch are the first signs that this is a place to slow down, relax and enjoy yourself. Inside, this Queen Anne Victorian that is listed on the National Register of Historic Places is furnished with antiques and family heirlooms that take you back to an era of comfortable luxury. Excellent breakfasts, tea time, and personal attention make each day a special one. Lovely linens, china, silver and crystal add to the realization that, here, you are a special guest. 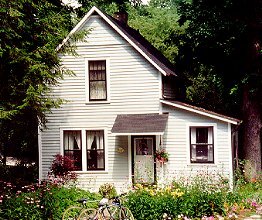 The carriage house (pictured below, with 3 bedrooms and 2 baths, living room, dining room, and complete kitchen), is a perfect accommodation for family groups and reunions. It also is in the Historic Register. 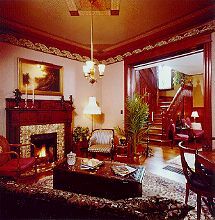 The Wright Inn bed and breakfast has eight sleeping rooms and a suite, two rooms have fireplaces and each has a private bath, cable TV, and telephone. The inn is centrally air conditioned and welcomes children over 12 years old. 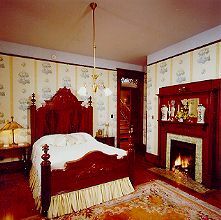 The carriage house offers a living room, dining room, kitchen, three bedrooms and two full baths and welcomes children of any age. This distinguished property is rated 3 Diamond by AAA.